Endangered Species Friday: Aquila nipalensis | Wind Farms Pushing Steppe Eagle into Extinction? The Steppe Eagle was formally identified by Dr Brian Houghton Hodgson (1 February 1800 or more likely 1801 – 23 May 1894) was a pioneer naturalist and ethnologist working in India and Nepal where he was a British Resident. He described numerous species of birds and mammals from the Himalayas, and several birds were named after him by others such as Edward Blyth. Dr Brian H. Hodgson was a scholar of Tibetan Buddhism and wrote extensively on a range of topics relating to linguistics and religion. He was an opponent of the British proposal to introduce English as the official medium of instruction in Indian schools. Had Dr H. Hodgson not introduced English into the many Indian schools, its very likely very few Indian citizens would today know how to speak the English language. A. nipalensis is listed as (endangered), although its likely the predatory eagle will soon be relisted as (critically endangered), should conservation efforts not improve the current status of this remarkable bird of prey, however this particular bird is somewhat of a mystery. The major reason why this species is listed as (endangered) which was only recently, is primarily due to wind farming of which birds are reported to fly directly into large structural turbines, which unfortunately, results in their death, or serious injury. Birds that are rescued suffering serious trauma are rarely released back into the wild, or make a full recovery. Afghanistan; Albania; Armenia; Azerbaijan; Bahrain; Bangladesh; Bhutan; Botswana; Bulgaria; China; Congo; Djibouti; Egypt; Eritrea; Ethiopia; Georgia; Greece; India; Iran, Islamic Republic of; Iraq; Israel; Jordan; Kazakhstan; Kenya; Kuwait; Kyrgyzstan; Lebanon; Malawi; Malaysia; Mongolia; Myanmar; Namibia; Nepal; Oman; Pakistan; Palestinian Territory, Occupied; Qatar; Russian Federation; Rwanda; Saudi Arabia; Singapore; South Africa; South Sudan; Sudan; Swaziland; Syrian Arab Republic; Tajikistan; Tanzania, United Republic of; Thailand; Turkey; Turkmenistan; Uganda; Ukraine; United Arab Emirates; Uzbekistan; Viet Nam; Yemen; Zambia and finally Zimbabwe. Aquila nipalensis is also a vagrant visitor to most of Northern Europe, Eastern Europe, South East Asia, Southern and Eastern Africa, ranging from Spain; Norway; France; Germany; Finland, Korea; Somalia; Slovakia Etc. Continued rate of decline is (unknown), which is concerning bird lovers and conservationists. Data recorded from the last assessment back in (2015), stated that populations are declining very rapidly. There seems to have been some perplexing information from the last assessment (before 2015’s) relating to population trend conducted we believe in (2010 or 2012). However the (2015) assessment has confirmed that the current population trend may stand at some: 100,000-499,999 (which is an estimate band or population band). Populations are not known to be (seriously fragmented). Surveys conducted back in (2001) placed the number of pairs at ‘80,000 pairs or 160,000 mature individuals’. Unfortunately the (European population) is estimated to be standing at 800-1,200 pairs in total. Bird-Life International (2015) estimated that Europe holds the lowest population density standing at some 9%. So a very preliminary estimate of the global population size is 17,800-26,700 mature individuals. A further assessment back in (2001) relating to the European trend stated “160,000 mature individuals was much lower than previously believed”. So as one can see ‘population uncertainty’ is the second likely reason why the species has been re-listed as (endangered). Not forgetting being rather confusing at times too. The latest, and most current population assessment estimate states numbers range (in total) at 31,372 (26,014-36,731) which equates to 62,744 (52,028-73,462) mature individuals or 94,116 (78,042-110,193) individuals. The population is placed in the band 100,000 to 499,999 mature individuals. It must be noted that 100,000 to 499,999 is not the true population count, but more the ‘band that the species currently stands at/qualifies for’. 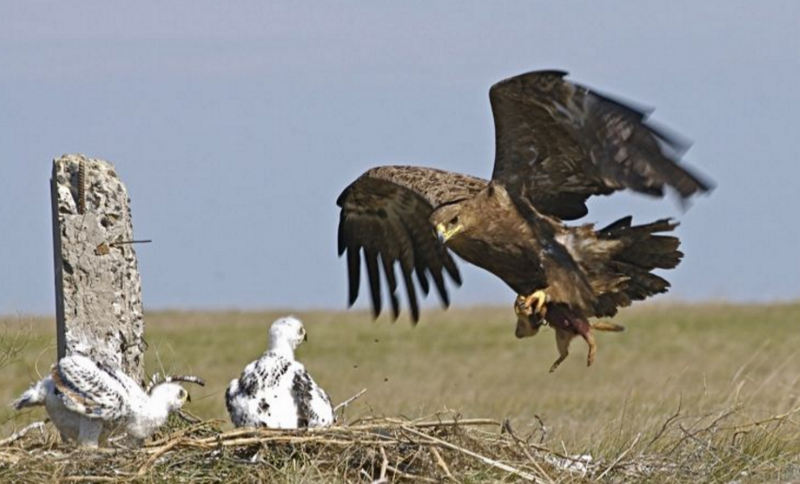 Habitat destruction, agriculture, conversion of Steppe Eagle land for farming, persecutions, but most worrying is wind-farming that is “seriously threatening the species as we know it today”. Collisions with wind-turbines is quite a serious concern as the Steppe Eagle is not exactly a small bird, and when hunting, especially within converted land that hosts wind farms, Steppe Eagles are either killed or seriously injured to the point that they can never be rehabilitated back to the wild. Night collisions are reported more than day collisions. Image: White tailed Eagle killed after colliding with a wind farm in the background. 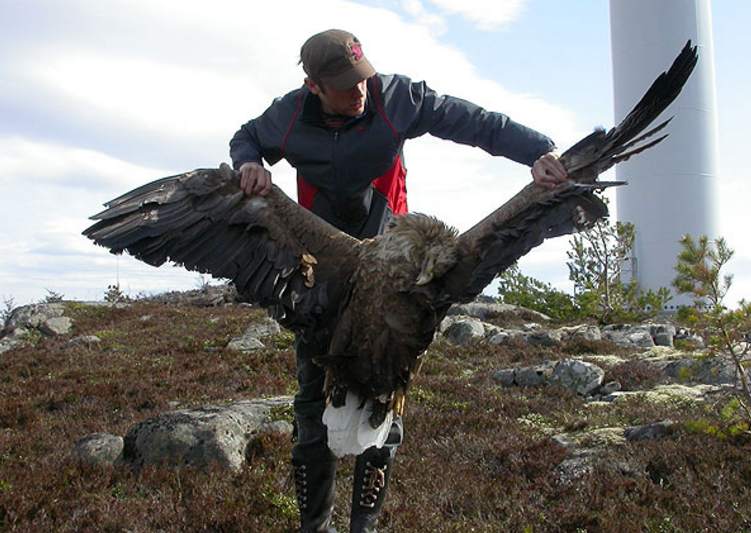 The image above depicts a White Tailed Eagle that was located dead after a suspected collision with a wind turbine. As one can clearly see these Eagles are not small, nor are wind turbines. Unfortunately birds come off the worst as we humans crave more and more greener energy. The only real reasonable solution here would be to now lobby governments and industries to build wind farms away from ‘all bird habitat’, or at sea. Unfortunately, again this is easier said than done. While at sea wind turbines are being blamed for whale beaching’s due to turbine vibrations, meanwhile birds are mostly, sadly dying when hitting these gigantic steel/carbon structure’s. 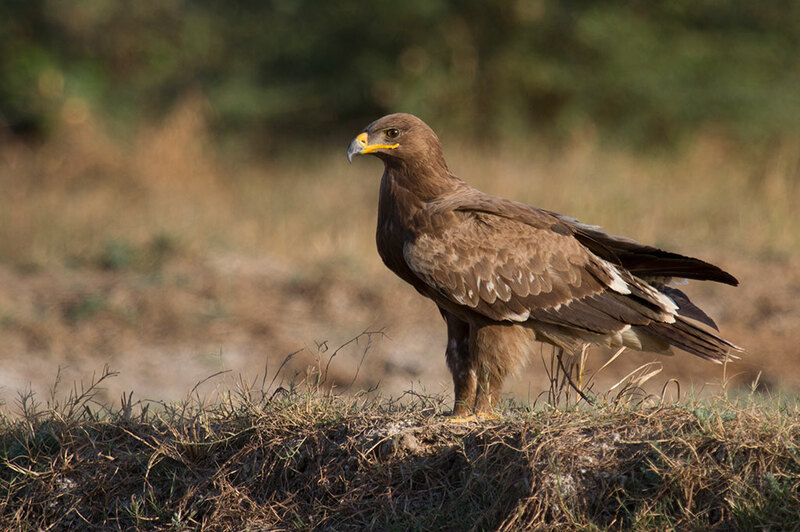 Steppe Eagles migrate, and are said to be closely related to the subspecies Aquila rapax. Steppe Eagles are around 25-31 inches in length, with a mean wingspan of 5.1-7.1 feet. Females weigh 5-10 lbs, while males weigh in at around 4.4 to 7.7 lbs. Steppe Eagles are said to breed mainly from Romania of which the species is currently (regionally extinct) within the country. Further evaluation of breeding behavior states the species breeds in Central Asia, Mongolia to Africa, with further breeding occurring within Eastern Europe. Females lay on average 1-3 eggs within a clutch. Image: Credited: Peter Romanow (Germany). Listed on the (Convention of International trade in Endangered Species wild flora and fauna – Cites), Cites Appendix II. Threats are listed below for your information. Young eagles are taken out of the nest in order to sell them to western European countries. A decline in the number of birds and a reduction in the proportion of juveniles migrating over Eilat, Israel began immediately after the Chernobyl nuclear accident in 1986, leading Yosef and Fornadari (2004) to suggest that the species may have been affected by radioactive contamination. This species is vulnerable to the veterinary drug Diclofenac too. Read more here on Chernobyl. Wind energy is the fastest growing source of power worldwide according to the World Bank. China plans a 60% increase in the next three years and the US a six-fold jump by 2030. The EU aims to produce 20% of its energy through renewables by 2020 – much of this is from wind. Will this huge expansion of wind farms have a serious impact on bird life? It looks likely, especially where birds habitat is being encroached onto by such developments. The U.S. Fish and Wildlife Service (FWS) estimates that 440,000 birds are killed in collisions with wind turbines each year; without stronger regulation, says the American Bird Conservancy (ABC), the annual toll will exceed one million by 2030. To address this issue, the U.S. Department of the Interior has released voluntary guidelines to help developers minimize the impact of wind energy projects on bird habitat and migration. Developed over five years with an advisory committee that included government agencies, the wind energy industry, and some conservation organizations, the guidelines are intended to ensure compliance with federal laws such as the Endangered Species Act—although the rules allowing them to do so are controversial. 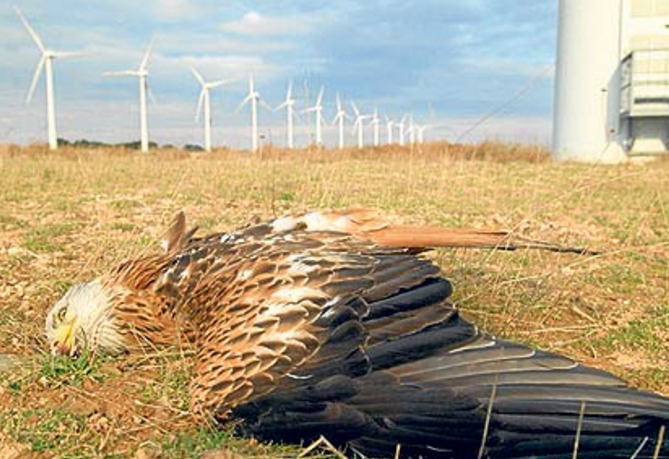 Image: Red Kite killed found dead after colliding with a wind-turbine. There are reasons why birds are likely to be affected by wind farms. Wind developments tend to be placed in upland areas with strong wind currents that have a lot of potential to generate energy. Birds – particularly raptors like eagles or vultures – use these currents as highways – and so are likely to come into contact with the turbines. It’s not just the turbine blades that pose a risk to birds; research indicates that wind developments can disrupt migration routes. What’s more, foraging and nesting habitat can also be lost when turbines are put up. Despite these concerns, the current body of research suggests wind farms have not significantly reduced bird populations. Several studies suggest birds have the ability to detect wind turbines in time and change their flight path early enough to avoid them. And one small study found no evidence for sustained decline in two upland bird species on a wind farm site after it had been operating for three years. Another found that wild geese are able to avoid offshore wind turbines. (Geese though fly at daytime, and are not predatory day and nighttime carnivorousness hunters). A large peer-reviewed study in the Journal of Ecology monitored data for ten different bird species across 18 wind farm sites in the UK. It found that two of them- curlew and snipe – saw a drop in population during the construction phase, which did not recover afterwards. But the population of the other eight species were restored once the wind farms were built. The current fate relating to the Steppe Eagle is somewhat worrying. Agriculture, persecution, young theft for trade, and wind – turbine farming is all but concerning plundering the species into further threatened status. After reading many studies dating back to 2012 regarding wind turbines, and whether they were indeed responsible for bird deaths, 2012 evidence didn’t really show much to prove that birds were affected. However after reading the ‘damning evidence relating to the Steppe Eagle’, its without a doubt that wind farms are most certainly ‘impacting on this species and others’ locally and internationally. The question is how do we deal with this problem? We need wind to generate more greener energy thus decreasing our carbon emissions. Furthermore we also need birds of prey to control rodent, insect, and general pest control. Large birds of prey are also very useful within Anti Poaching operations, and act as the eyes and ears for both farmers and anti poachers. While there is no evidence to prove my own suspicions here, I do believe that certain bodies within government are being forced to ignore ongoing issues with wind farms and bird collisions. The excuse that birds can quickly change course is indeed factual to some degree, well, only if the bird is flying during daytime hours. Unfortunately most birds of prey also fly and hunt at night. So how is one supposed to change their course (at nighttime when unable to see the turbine in time)? Please view the videos below for more information. Thank you for reading, please share and help create more noise about this subject before time runs out. Dr Jose. C. Depre PhD. MEnvSc. BSc(Hons) Botany, PhD(NeuroSci) D.V.M.